Horrorscreams Videovault - UK based horror site with news, reviews, interviews and more. 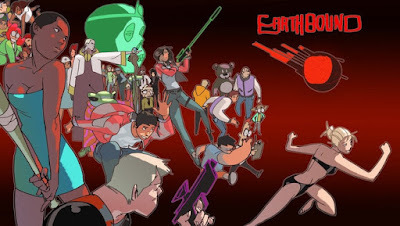 : CAUTIONARY COMICS GETS EARTHBOUND! Two Headhunters converge on Earth to recruit 5 deadly warriors for the Galactic Grande Prix. Cautionary Comics will publish a new sci-fi graphic novel, Earthbound: Between Two Breaths on Earth, from creator Per Berg. Spaceman and Julia are sent to Earth to recruit the Sirens of Violence, four deadly warriors hiding out. Whoever recruits more of the four shall earn their freedom. In the case of a tie, Wiz Kid, their ex-teammate who happens to be stranded on Earth, will be the tie breaker. Per Berg AKA Narwhal is a comic writer/artist living out of Portland OR, he previously illustrated MACHETE SQUAD from the imprint Dead Reckoning. Earthbound is his passion-project and will eventually exceed 600 pages to tell the full story.